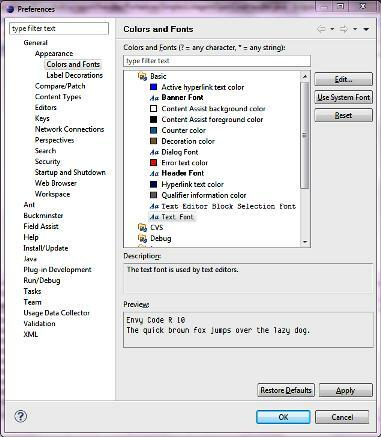 Within Eclipse, select Menu Window > Preferences. This will open up the Preferences dialog. At the top of the list on the left you will see General. Click to open this. Next click Appearances. Finally, select Colors and Fonts from under Appearances. Look for “Text Font” under the “Basic” node in the tree on the right. Select it and click on Edit button. Now, select the new font and apply it. If you mess it, just click the Reset button to go back to your old settings.